The islands in the bay that are definitely worth visiting. The smaller is St Honorat, which has a monastery and ruined castle. The monks sell monastery-made food and drink products like wine which make unique souvenirs. 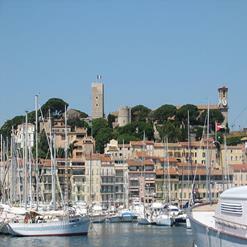 The larger island is Ste Marguerite which also has a castle, shops, bars, and restaurants. Find a quiet cove, some shade from palm trees, and a cheap snorkel before you swim around the rocky coves.